The 3,2000 Caulkins Water Farm stores runoff water, water released from Lake Okeechobee, and rainfall. 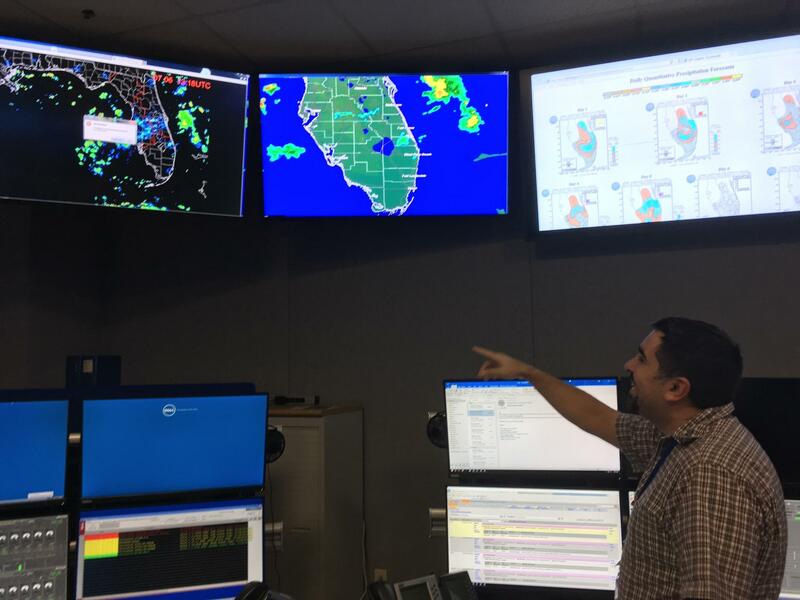 SFWMD operations control specialist Ariosto Munoz alters the flow of water from a control room in the West Palm Beach headquarters. For the first time, SFWMD is partnering with a private entity to control excess water. 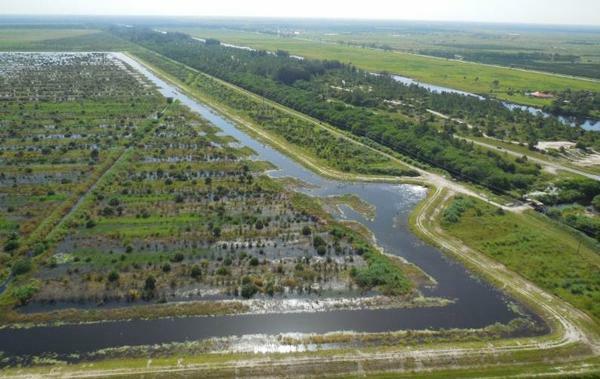 The privately-owned Caulkins Water Farm, east of Indiantown, is gathering runoff water -released from Lake Okeechobee-, and rainfall that could otherwise flood the region and harm the St. Lucie Estuary. The project is one of the most effective at reducing problems associated with South Florida’s excess water, according to SFWMD Chief of State and Agricultural Policy Ansley Marr. “We take the water when nobody needs it,” said Marr, explaining the kinds of surplus conditions the farm reacts to. The Caulkins family has full responsibility for pumping water into their 3,200-acre farm. Because of evaporation and pervious soil, the farm has a high capacity to be replenished. Because water levels go down naturally, a continuous cycle of water can be pumped into the farm from the C44 Canal. The Caulkins family receives $5.5 million per year to pump and hold water. Marr said the farm’s high capacity for storing water means water never has to be released from the farm to estuaries. Not releasing water from the farm also means no old fertilizer residue will seep out. Marr explained that the Caulkins Water Farm is also unique because it is privately owned and maintained, unlike other water farms which are government-run. According to Marr, private landowners could apply to become water farms, and then SFWMD analyzed different locales to see which was most cost-effective. Pilot programs began in 2014. In 2018, the Caulkins Water Farm officially opened for operation. The Caulkins family farm used to grow citrus, but their crops faced challenges in recent years. When they could no longer grow citrus successfully, they put their land to work for SFWMD, said Marr.